the Tamil Nadu government has brought the Bt Cotton seed issue back into focus by banning the sale of seeds from Mahyco over complaints of crop failure in Dharmapuri district. Bt Cotton varieties made by the Indian seed major had earlier been blacklisted by Andhra Pradesh after crop failures in the 2004 kharif season (see 'Askew' Down To Earth, Aug 31, 2005). In Dharmapuri, thousands of farmers are in distress. They told the district collector that their Bt Cotton crop failed due to sub-standard seeds. "Cotton crop on at least 2,500 acres (1,012 hectares) has failed and about 2,000 farmers affected. Prima facie, it seems that the seeds are responsible," says Pankaj Kumar Bansal, Dharmapuri's district magistrate. The state government has taken serious note of the problem and ordered an enquiry. "Mahyco has been asked not to sell any seed in the state till the enquiry concludes. They should also compensate affected farmers," says Veerapandi S Arumugam, Tamil Nadu agriculture minister. The anti-gm lobby in the state is happy over the ban. "After the failure in Andhra Pradesh, Bt has failed yet again. Such failures of genetic engineering (ge) technology are always at the cost of poor farmers. The aggressive marketing tactics of the seed companies is the sole reason behind further spreading of Bt cotton even after repeated failures," says Rajesh Krishnan, ge campaigner, Greenpeace. Failure to instruct? It is still not clear, however, whether the Dharmapuri crop failure can be blamed on substandard seeds. Citing one case, Surjit K Chaudhury, the Tamil Nadu agriculture secretary, says that a farmer obtained 15 quintal of cotton from an acre, netting a profit of Rs 54,000 after deducting the seed cost of Rs 6,000 per acre. The failure could also be attributed to wrong agricultural practices and inadequate support from the company. "Either you sell your seed with usage instructions or if it fails, give compensation," says Chaudhury, who is also agriculture productivity commissioner. Mahyco does not deny the crop failure in Dharmapuri. But it maintains its seeds have anything to do with it. "There is a wilting problem but it is not necessarily because of seeds. We have instructions written in the inside of each packet. For compensation, the government has formed a committee. Very soon we will decide on it," clarifies Sanjay Despande, deputy general manager, Mahyco. 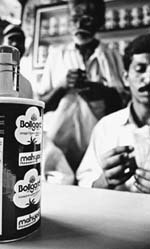 Dealings--in and out of court Earlier, in 2006, Monsanto's licensee, Mahyco Monsanto Biotech India Limited (mmb), was charging Rs 1,250 as 'trait value' (another name for royalty) out of the prevailing rate of Rs 1,800 for 450-gramme packets. The Andhra government fixed the price of seeds at Rs 750 for 450 grammes. When Monsanto refused to comply, Andhra Pradesh took the issue to the Monopolies and Restrictive Trade Practices Commission (mrtpc) in January 2006. In its interim order on May 10, 2006, mrtpc asked mmb to reduce the 'trait value'. The company then moved the Supreme Court (see 'Bt brouhaha', Down To Earth, July 15, 2006). The final hearing on the issue in mrtpc is scheduled for January 29, 2007. Thereafter the government would decide its strategy for next hearing in Supreme Court. But, in Andhra Pradesh, there are also moves for an out of court settlement over the price of Bt Cotton seeds. "Some Indian seed companies operating in the state have approached us to press for an out of court settlement saying that they are ready to abide by the government decision. We are ready if it is in the interest of farmers, and since other states have also joined the litigation, they should also be ready for an out of court settlement," says N Raghuveera Reddy, agriculture minister, Andhra Pradesh. Activists are upset that the state government that had taken up the cause of farmers is compromising with a company whose seed failures have led to farmer suicides. "This step actually shows the clout the seed companies hold," says Krishnan. Suman Sahai of Gene Campaign feels that the judicial process should continue since it will generate a lot of information, which will be available in the public domain.